Plum at Koganei Park (小金井公園の梅林). Koganei Park has a nice plum garden that has about 100 different kinds of plum trees that bloom from the middle of February to early March. Koganei Park (小金井公園, koganeikouen) is one of the best 100 Sakura spots in Japan. The park was established for 2600 years anniversary of the empire. There are many institutions and facilities for many kinds of sports and activities. 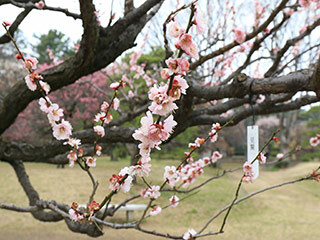 There are about 50 kinds 1800 Sakura are planted, and Hanami period many events held in this park.